This discussion of the dental amalgam controversy outlines the debate over whether dental amalgam (the "silver" in dental fillings) should be used.Supporters claim that it is safe,effective and long-lasting while critics argue that claims have been made since the 1840s that amalgam is unsafe because it may cause mercury poisoning and other toxicity.For this reason,some critics say that,even if amalgam was used in the past,it should now be discontinued. 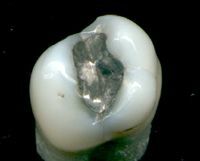 Those who are not opposed to the use of amalgam point out that it is safe,durable,relatively inexpensive,and easy to use.On average,amalgam last twice as long as resin composites,take less time to place,is tolerant of saliva or blood contamination during placement (unlike composites),and are often about 20-30% less expensive.Consumer Reports has suggested that many who claim dental amalgam is not safe,are "prospecting for disease" and using pseudoscience to scare patients into more lucrative treatment options. Those opposed to amalgam suggest that modern composites are improving in strength.In addition to their claims of possible health and ethical issues,opponents of dental amalgam fillings claim amalgam fillings contribute to mercury contamination of the environmental.The World Health Organization reports that health care facilities,including dental offices,account for as much as 5% of total waste water mercury emissions.They also point out that amalgam separators,installed in the waste water lines of many dental offices,dramatically decrease the release of mercury into the public sewer system but critics say that the separators are not mandatory in some states of the United States.The critics also point to cremation of dental fillings as an additional source of air pollution,contributing about 1% of total global emissions. As public pressure demands more research on amalgam safety,an increasing number of studies with larger sample sizes are being conducted.Those who are not opposed to amalgam claim that,aside from rare and localized tissue irritation,recent evidence-based research has continued to demonstrate no ill effects from the minute amounts of mercury exposure from amalgam fillings.A 2004 systematic review conducted by the Life Sciences Research Office,whose clients include the FDA and NIH,concluded that "the current data are insufficient to support an association between mercury release from dental amalgam and the various complaints that have been attributed to this restoration material".A systematic review in 2009 demonstrated that mercury released from amalgam restorations does not give rise to toxic effects on the nervous system of children.More recently,a Cochrane Systematic review in 2014 indicated there is no significant difference in adverse health effects in individuals with composite or amalgam restorations. Those opposed to dental amalgam suggest that mercury from dental amalgam may lead to nephrotoxicity,neurobehavioural changes,autoimmunity,oxidative stress,autism,skin and mucosa alterations,non-specific symptoms and complaints,Alzheimer's disease,and multiple sclerosis.